Justin Bieber got back to his Canadian roots on Saturday, pulling on his skates for a game of ice hockey in New York City. 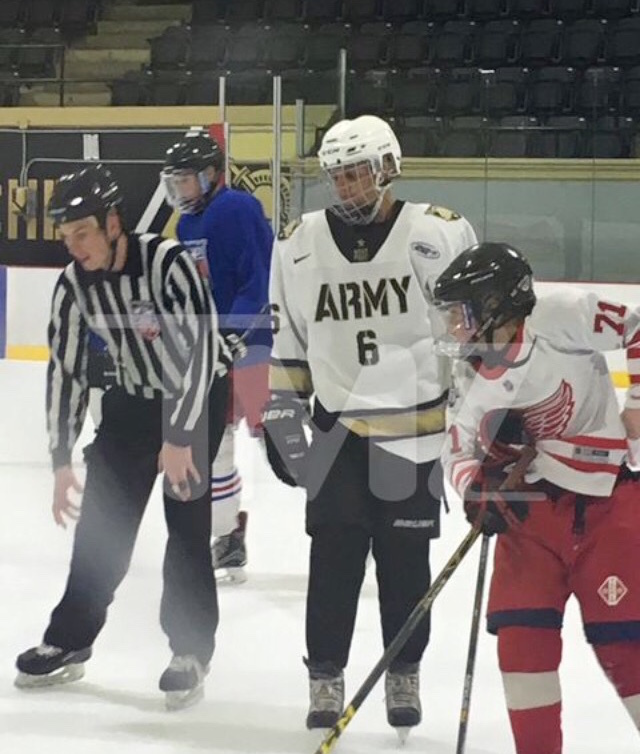 Justin hit the ice alongside the official Army West Point team, playing alongside army cadets. The team had invited JB to play with them, and he finally took them up on the offer, donning a number six jersey emblazoned with forward Nick DeCenzo’s name. The Army West Point team tweeted this photo with Justin Bieber (center), captioning it, ‘Bieber knows the rules… Respect the logo’. Watch video below: Justin Bieber brushed up on his hockey skills by hitting the ice with the Army West Point team in New York. The Biebs proved that he’s got the prowess to dominate on the ice, and got the respect of his teammates, too. See him score here!